The Bakugan game was developed by Sega Toys and Spin Master with the overwhelming response to the anime series. The game involves strategy, metal cards, and Bakugan balls that spring up miniature Bakugans. The goal of the game is to capture three Gate cards, and you start the duel by laying out your metal card and then rolling a Bakugan that will magnetically open on that card. The winner is determined by calculating who among the players has the highest total G-power. The Bakugan game is not just between two players. It can also be played by up to four people, while the rules stay the same. We can also play the game by using six Gate Cards instead of the usual three, six Ability Cards and six Bakugan. In this game, a player must also have to capture six instead of the usual three cards to win. 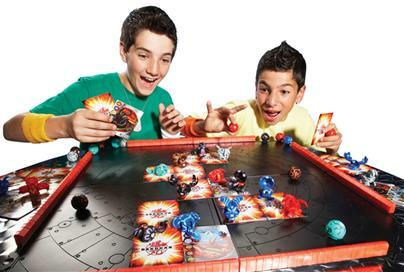 As the Bakugan game grew to popularity, so did numerous accessories and toys that complement the game completely. Available throughout many stores right now are carry clips that can store three Bakugan balls, launchers that can fire the balls at the game area, play area mats, special gauntlets, and many more! There are also a lot of additions to the usual Bakugans --- evolved Bakugans and combinations like the Maxus Dragonoid and Maxus Helios. Not surprisingly, the Bakugan Battle Brawlers were given the 2009 Toy of the Year award by the Toy Industry Association. Electronics have been introduced and sold with the Bakugan brand. These electronic products include digital cameras, alarm clocks, and others that are part of a kid's daily life. Here are the rules on how to play Bakugan as it was released in its first season and first series of toys. A video game was also created, titled the Bakugan Battle Brawlers™, in 2009. Versions were created for Wii, Nintendo DS, Xbox 360, Playstation 2, and Playstation 3 platforms. The plot of the Bakugan video game is about a player who want to become a Bakugan Battle Brawler. A special Bakugan named Leonidas is also introduced in the game, although there has been no word if Leonidas will make an appearance in the anime series. The video game was released October 20, 2009. 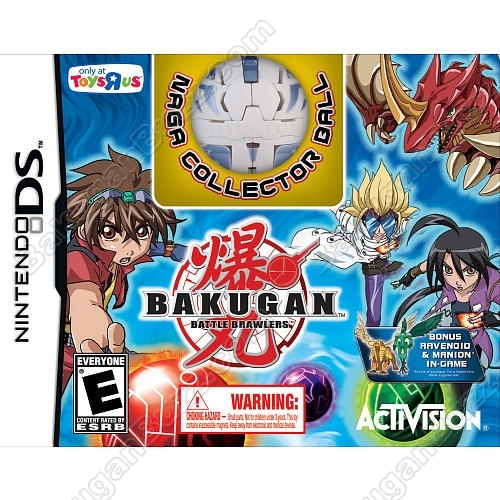 The Bakugan Battle Brawlers™ Nintendo DS Collector's Edition video game also contains an exclusive White Naga collector ball! It is the same as any regular Naga, but has no determined attribute. When used in brawling, it will take on the highlighted attribute of the gate card in play. 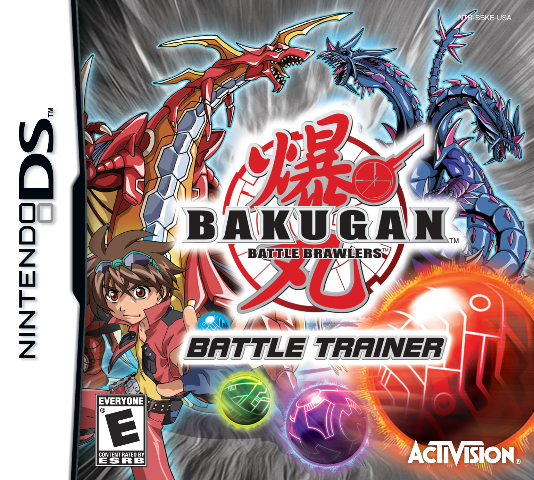 On March 2010, Activision released another video game that focuses on training a brawler and honing his skills and that of his or her Bakugan. Bakugan Battle Trainer™ is a game wherein players will be performing various training methods as well as brawls in order to level up and help rescue the other Bakugan that were imprisoned by an enemy. In early 2010, Spinmaster announced that they will be launching an online MMORPG game called the Bakugan Dimensions, enabling players to get into the action of brawling online! Launching was delayed for a time until the game was finally open on June (after beta testing months before). Bakugan Dimensions is like Marucho's Bakugan Interspace in the third season of the anime series, Bakugan Battle Brawlers: Gundalian Invaders, where brawlers go cyberspace and brawl with other brawlers from all over the world. To log into Bakugan Dimensions and get yourself a Bakugan, you will need the DNA codes found on Gundalian Invaders Bakugan. These Bakugan Codes are heat-reveal and is 10 digits long. Bakugan Battle Gears, Super Assault Bakugan, BakuCoins, Bakugan Dekas, and others also possess codes that can be used in Bakugan Dimensions. In fall 2010, Activision will release the sequel to the Bakugan Battle Brawlers™ video game, titled Bakugan Battle Brawlers™: Defenders of the Core. The game is in sync with season 2 of the Bakugan anime series, Bakugan Battle Brawlers: New Vestroia. The player will be able to create a new brawler who will help the other brawlers in saving Earth against Spectra and the Vexos. Bakugan Battle Brawlers™: Defenders of the Core boasts of bigger and better features and animation. It is coupled with real-time battle gameplay. It also features split-screen multiplayer action in three different game modes in the console versions, and linked multiplayer on Nintendo DS™ and PSP system. Bakugan Battle Brawlers™: Defenders of the Core will be out on November 2010, and will be available for Nintendo DS, Wii, PSP, PlayStation 3 and Xbox 360.
i have all the battle gear bakugan.